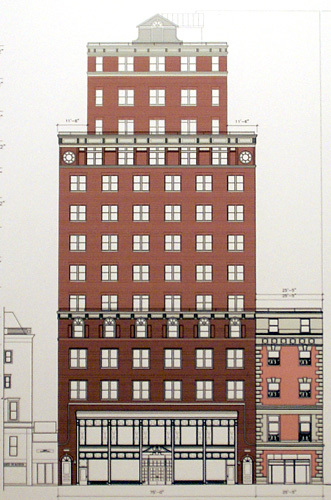 The New York City Landmarks Preservation Commission held a hearing January 22, 2007 on plans to demolish the two-story building at 746 Madison Avenue and replace it with a 14-story, mixed-use building planned by Friedland Properties. Friedland Properties is also asking the commission to issue a report to the City Planning Commission relating to an application to waive mid-block transition height limits for the project. 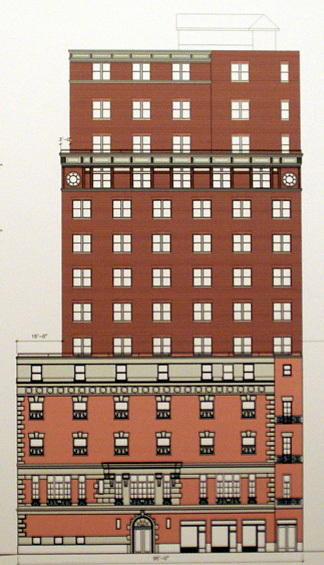 The proposed building, which is between 64th and 65th Streets, has been designed by Page Ayres Cowley and would contain 12 residential condominium apartments and four floors of commercial space that connect to a townhouse, shown in pink in the above rendering, designed in 1897 by Grosvenor Atterbury on the southwest corner of the avenue and 65th Street that is also owned by Friedland Properties. 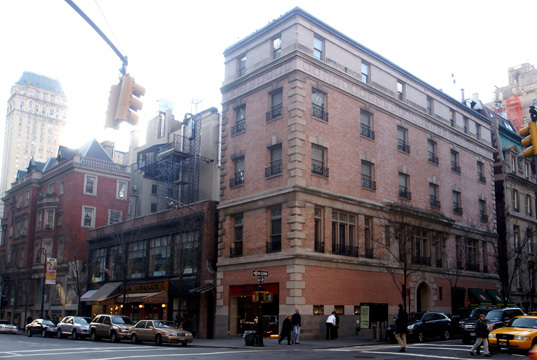 The apartments would have an entrance through the townhouse on 65th Street. The proposed, red-brick building would have a 15-foot setback above the 5th floor to honor the street-wall context on the avenue. It has oculi at some of its corners and would utilize less than the site's available development rights. Several preservation groups testified that they could not support the demolition of a "contributing" or "style" building within an historic district. All buildings in such districts are separated into "contributing" and "non-contributing" categories that relate to their architectural and historic significance. "Although this application is proposing to salvage the storefront of the existing two-story structure and reincorporate it into the proposed building, what we will have is a new 14-story building with a historic remnant. This is not a 12-story rooftop addition; it is the demolition of a style building," declared the spokesperson for the Friends of the Upper East Side Historic Districts. "The demolition and addition to the two-story building divorces the cast iron facade from its historic fabric and transforms the reading of the building. As a result, the restored storefront looks applied rather than preserved. Many committee members felt the three-story addition directly above the historic facade overwhelms and flattens the base of the building," declared Lisa Kersavage, director of advocacy and policy for the Municipal Art Society. The building originally was a four-story school erected in 1917 and its top two floors were removed in 1937. "While we admire much about the architect's design," Roger Lang said, speaking on behalf of the New York Landmarks Conservancy, "This survivor deserves better than just a recycle storefront as mitigation. To be sure, the 1937 alterations were unfortunate; but they could just as readily be reconstructed instead of forgotten." Mr, Lang also said that "we think the height of the proposal is excessive and inappropriate." "The added bulk will interfere with views of a picturesque French Renaissance Revival building to the south, and of the tower of the Pierre beyond," declared Christabel Gough, the secretary of The Society for the Architecture of the City. "The application...avoids contemporary styling, but is a pale imitation of the Georgian, in decoration, not in form, due to its curious embrace of the corner building and its rather humble, half-hidden entrance around the back, on the side street," she continued. A letter signed by 229 residents of 64th and 65th Streets and Madison Avenue was entered into testimony in opposition. Robert Propp, a resident in the area, however, said he would "love to see the new building" rather than the "ugly" rears of buildings to the east, adding that he was "sorry for people that might lose views," but that that was not a legitimate "concern." John Tashjian, another nearby resident, described the proposed building's design as "quite appealing" and representative of "strong, responsible architecture." Robert Shapiro declared that the proposed building was "good architecture" that would "certainly enhance the neighborhood." An article by Christopher Gray in the January 6, 2007 edition of The New York Times noted that in 1885 Temple B'nai Jeshurun erected a Byzantine-Moorish-style synagogue on the site designed by Rafael Gustavino and Schwarzmann & Buchman. Several years later, John Jacob Astor wanted to build a stable on the adjacent corner lot but withdrew his plans after synagogue officials and residents in the area protested, according to Mr. Gray, who added that the town house on that site was built by Frederic Betts. In 1917, the synagogue was replaced by a four-story school that was erected by William H. Chesebrough and designed by Rouse & Goldstone. In 1937, the top two floors the building were removed in an alteration designed by Kenneth B. Norton and in the 1940s the Navy League of the United States, according to Mr. Gray, occupied the upper floor as a workroom where women sewed cloths for the children of enlisted Navy men. Friedland Properties, of which Lawrence and Melvin Friedland are principals, proclaims on its website that it is "the largest landlord on the gold coast of Madison Avenue." 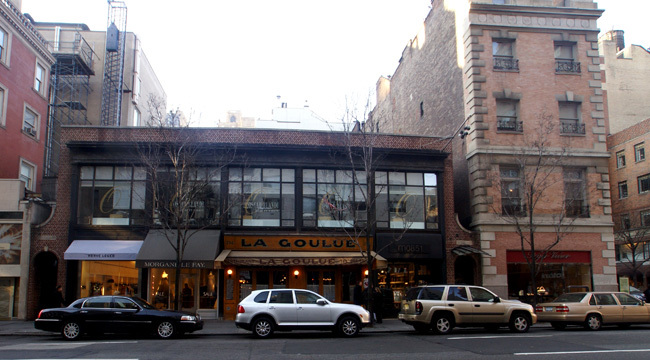 One of the retail tenants now on the site is La Goulue, a popular restaurant. The arguments of the preservation groups opposing the proposal are based in large part on concerns that it would set a precedent to demolish a building in an historic district that has been characterized by the commission as contributing to the district's architectural and historical importance. That argument, however, is not very strong inasmuch as the building had been radically altered with the removal of its top half in 1937. Furthermore, the "glory" of the "remnant" is its nicely styled cast-iron two story storefront that will be transferred to the new structure. The commission has on many occasions authorized restorations of important elements and the new plan does not really violate any aesthetic or preservationist aesthetic as it streetfront would retain its bright and cheery charm only now beneath three stories rather two extra floors of red brick at the street wall that closely matches its immediate neighbors, a good and sensitive touch. The opposition, then comes down to the question of the project's height, which, at 14 stories, is not out of context with much of Madison Avenue. The criticism that it may be the only block in the special preservation district that would have a "tower" not at its corners but mid-block is a far-fetched stretch of logic even if true as it is mitigated greatly by the setback at 63.5 feet. Mr. Propp's comments that many of those in opposition are probably only concerned about having some of their views obstructed and that such a concern has no weight in the argument about its appropriateness and that the proposed "tower" would block some less than magnificent vistas of the non-limestone-clad backs of several buildings are right on the mark. The project's design obviously tries to recall quality. traditional, mid-rise, pre-war apartment building designs and succeeds to a great extent although it might consider a slightly stronger rooftop treatment. This project definitely is not as prominent and attention-getting as the one that the commission failed to approve for 980 Madison Avenue where Sir Norman Foster designed a 22-story apartment building of cylindrical forms and reflective glass atop the existing 5-story building across from the Carlyle Hotel (see The City Review article). Because of the late hour when the application came up at the commission, the commission decided to continue the hearing at a later date when comments could be made by the commissioners and the applicant could address their comments and the public's. The landmarks committee of Community Board 8 voted unanimously June 16, 2008 to recommend that the Landmarks Preservation issue a certificate of appropriateness for a revised and downsized plan by Friedland Properties to develop a site at 746 Madison Avenue between 64th and 65th Streets. The revised plan would add three stories to the existing 2-story structure that now houses La Goulue, the restaurant. 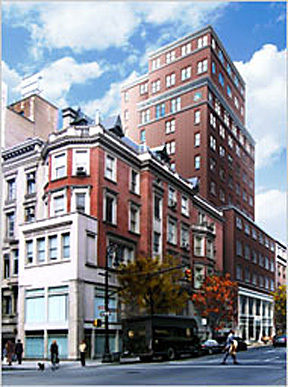 The previous plan called for a 14-story, mixed-use building with 12 residential condominium apartments and four floors of commercial space that would have connected with a townhouse designed in 1897 by Grosvenor Atterbury on the southwest corner of the avenue at 65th Street that is also owned by Friedland Properties. The new design by Page Ayres Cowley, who also designed the previous plan, would contain only commercial space and would not connect with the adjoining townhouse building at the corner. In the earlier plan, the proposed apartments would have an entrance through the corner townhouse building. Ms. Cowley told the committee that the existing, two-story, cast-iron facade on the building would be restored, as it would have been also in the previous plan, and that the red-brick facade of the upper three-floors of the building would be closely related in color to the existing base. The new design conforms to existing zoning and building regulations.